I love this dress, the high neckline, cinched waist and muted, petite floral print made this a must have. I chose not to belt it this time around but could definitely take it from day to night with a belt and some strappy heels. In other news, I have been using this fold over clutch from ClutchLine non stop since it arrived in the mail. I love how versatile it is, obviously for nights out it folds over and fits all of the necessities, wallet, keys, a few beauty products, etc. but the best part is that during the day I can unfold it to be used as a sleeve for my iPad, agenda and other daily essentials. 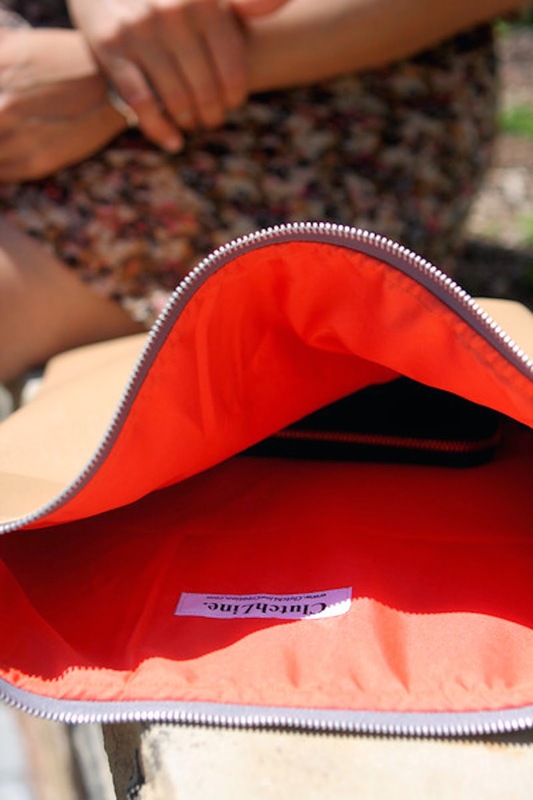 It's practical, great quality and how about that bright orange lining (there are other color options as well)! Loving this clutch as much as I am?! Make sure you check out the entire collection at ClutchLine Creation and snag your very own + you get $10 off your purchase with code "JASMIN10" at checkout! Linking up with Because Shanna Said So, Transatlantic Blonde, and The Pleated Poppy! So gorgeous! Playful and pretty print what can be more wonderful for summer. Welcome by sometime to see my latest. <3 Ada. Will do Ada, thanks for stopping by!